Last week we switched to a new schedule at Pedasi public school. With the new schedule we have lunch at school, we do extra activities and we stay at school an extra hour and a half. 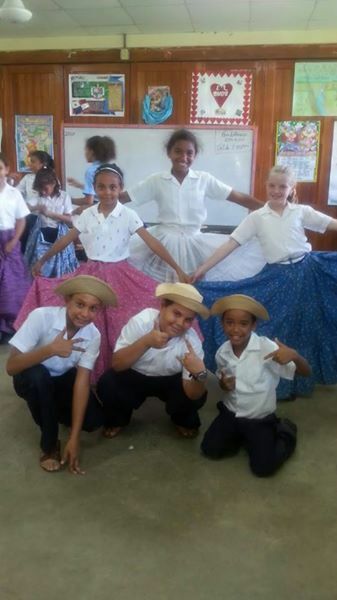 Some of the new activities are typical folkloric dancing, cooking, sports, more English and also computer class. Computer class was interesting, especially for 4th grade. As much as it surprises you, we actually have a computer lab, and yes, we all have our own mini laptops. The computer lab is a square, white tiled, dirty room, which has air conditioning (this is very good because none of the classrooms have air conditioning). The lab fits 18 students, and my class has 15 students, so we barely have room. Turns out that my friend’s strict English teacher was teaching the computer class. It was surprising that my class had no idea how to work the laptop, For example, they didn’t know how to use the backspace, space, nor enter keys. My class also didn’t know how to use the cursor and the “raton” (the mouse). We were also learning to type. We were typing our name, numbers up to ten, 3 phrases, and a short story. I actually taught my homeroom teacher, who was learning the same thing as my classmates. From my perspective, I thought it was good that they were learning, and in the future they will teach me a lot, for example, the typical dancing. See a picture down below! In the end I was a little embarrassed that I was basically the only one who knew how to work the computer. I felt happy because of that, so next time I will look forward to computer lab to help other students.